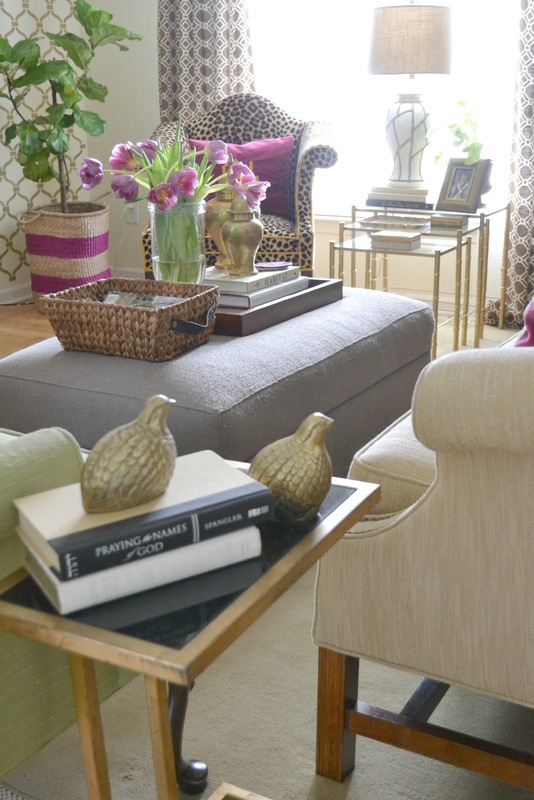 Dwell by Cheryl: "Upholstery Makeover: Ottoman Upgrade"
Well, it's that time again. Time for another upholstery project. Sometimes it takes a while for me to get going on a project. It's really a bit strange when you consider that other times, I can't move fast enough on getting things completed. 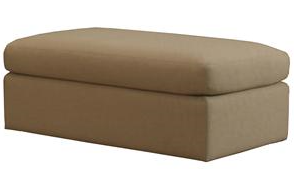 Whatever the reason, I'm finally addressing my coffee table/storage ottoman. You may recall when I picked it up on one of our ReStore shopping trips to the Catawba Valley ReStore. I blogged about it HERE. 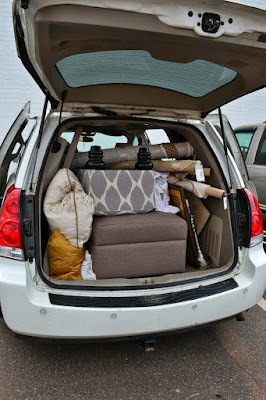 It was a great piece of McCreary Modern furniture with tons of storage and it was a steal. I purchased it with the intention to have it recovered, but honestly the longer I kept it the more used to it I became. The dolphin gray color doesn't exactly work with my current color scheme but it also doesn't fight with it either. It's sort of an afterthought and I'm ready to fix that. 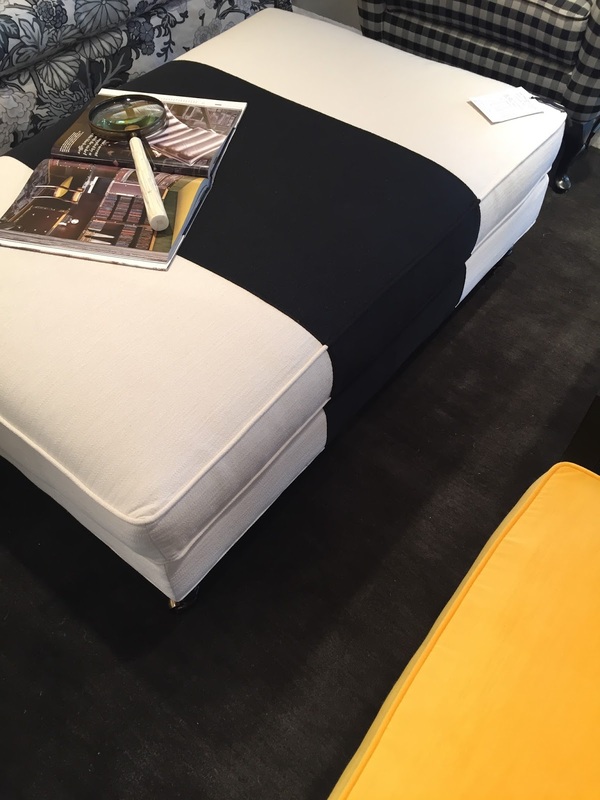 Originally I thought I'd used this ottoman with a contrasting strip that I spotted at High Point Market as my inspiration. 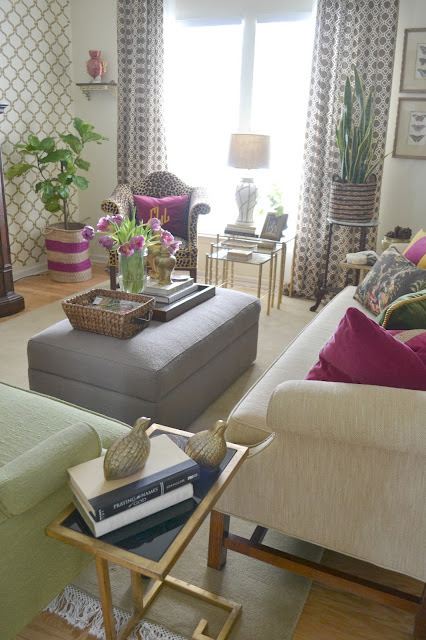 I was thinking I'd add a huge dose of color with a graphic fuchsia stripe down the middle. However, the more I thought about it, the more I wanted to select something that would work for years to come. 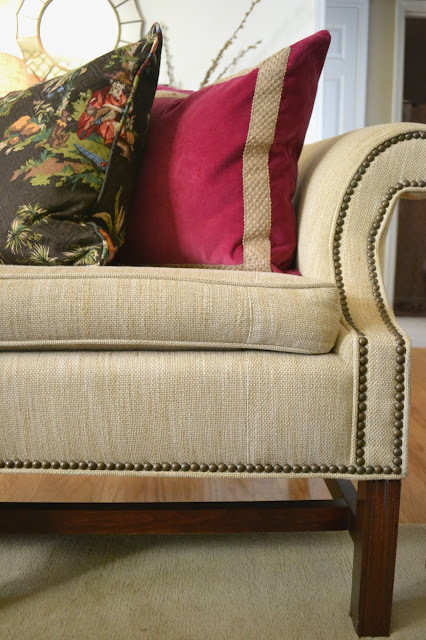 Ultimately, I decided to go with the same fabric that I used on my camelback sofa makeover several years ago. I figure having the two act as a set will allow for changes later on and produce a grounding affect that will allow my other accessories to take center stage. Of course, just covering it with a piece of golden cream fabric doesn't seem like much fun so I'm going to punch it up a notch with a nail head trim. I'm thinking about getting a little fancy here. I've been pinning some ideas and hope to make a decision and send this one off to Baity's Custom Upholstery soon! Follow Dwell by Cheryl Interiors' Board Ottomans: Upholstery Ideas on Pinterest. What a wonderful project to start off the year! 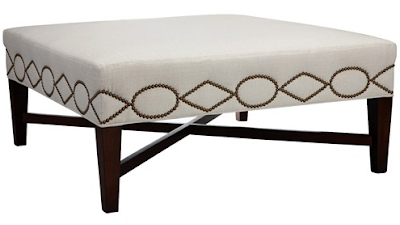 I do like your idea of using the nail heads as an accent, and using the same fabric as the couch. I cannot wait to see the possibilities...but I like the simple nail head trim without the designs. Cheryl, I had to stop by when I saw your post on Instagram! I love your inspiration and that ottoman! I agree, sometimes sticking with design that fits your style and will last over time is a better fit than what is currently trending. Can't wait to see how Baity's Custom Upholstery transforms this piece! Still loving your new website too! Thanks Sarah! I just need to decide on the details! We all know Mark will do an awesome job.